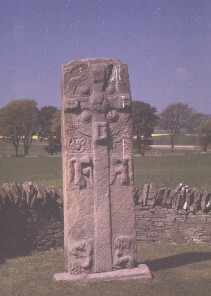 General view of the front of the slab, showing a decorated ringed cross. The cross has a raised boss in the centre, rectangular raised bosses at the four arms and four raised bosses in the space between the inside of the cross ring and the sides of the cross. On each side of the shaft are angels with books in their hands. There is a beast at the left hand side of the bottom of the cross shaft and a quadruped(?) on the right hand side of the bottom of the cross shaft.